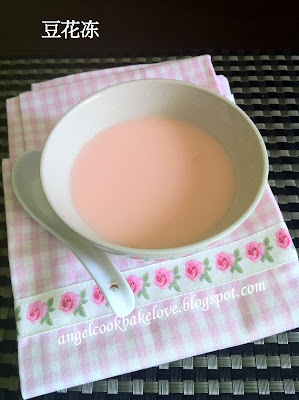 1) Heat up half soya milk in a saucepan over low heat (I also added some pandan leaves). 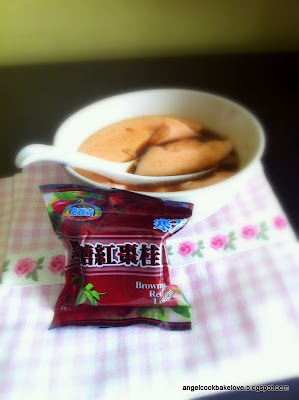 Meanwhile, dissolve agar-agar powder in the remaining soya milk. 2) When the soya milk becomes slightly hot, add the soya milk/agar-agar powder mixture, cook over low heat, stir from time to time till you see bubble on top (take about 5 mins, do not cook till boiling). Turn off heat. 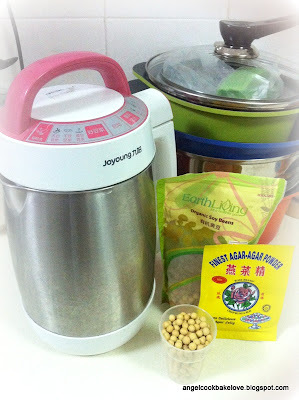 3) Pour the soya milk into bowls gently to avoid air bubbles. Scoop away bubbles on top (if any). Cool down to room temperature and refrigerate till set (about 3- 4 hours). Serve with your preferred syrup. The original ratio for agar-agar powder and soya milk is 1 tsp to 1.2 L (or ½ tsp to 600ml), because my home-made soya milk is more diluted so I reduce the amount to 1L and the texture came out just nice. Sonia (Nasi Lemak Lover) has shared her experiences in making this chilled bean curd in detail, do check out her blog post here if you want to find out more. very sweet pink colour TFF! This is like tao huay and tau huay is unsweetened that's why there is no sugar in the recipe and this is suppose to serve with syrup. However, if you prefer to eat it like pudding, feel free to add sugar or you can use sweetened soya milk. Please remember to leave your name when commenting next time so that I will know how to address you. hi angel, thanks for sharing yet another delighted tff recipe. Yeah, must also take in consideration of the diluted soya milk, you just reminded me..i must go and tell jessie of cooking moments , i think hers didnt set maybe due to the soya bean dilution. Haiiz, potty training needs patience..why not try not letting him wearing pampers so that he will feel uncomfortable once the motion is out? maybe he will know how dirty and messy it could be..as time gets by, hopefully he will find his habit of using potty. Hi Angel, Lena just told me about your version of the tofu pudding. That's why I want to come for a visit & study your recipe. I made them recently with 2 different recipes. 1 turned out perfect & the other one not so successful. That's why Lena brought my attention to your recipe! Oh 1 more thing, not sure whether I have become your follower b4 but there is no harm for being 1 again! You have a nice blog! Thanks for sharing with me. I have started to let my son go "pamperless" when he is at home except sleeping time. I guess I just need more patience. Thanks for your support. 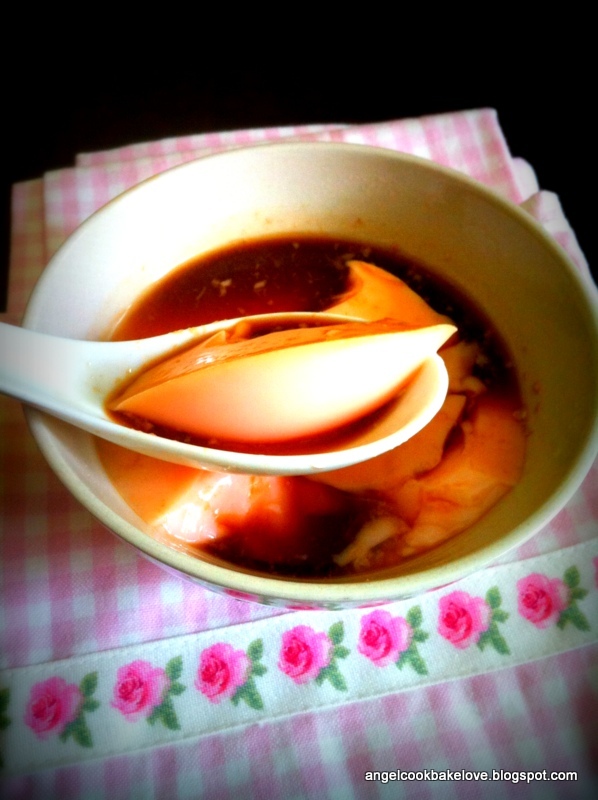 You too, have a yummy and heartwarming blog.